It's difficult to stop thinking and feeling. In this meditation session Ajahn Appichato teaches us a mantra to calm the mind. "Mindfulness is a tool" says Ajahn Brahm. Ajahn explains how mindfulness is only part of the Buddhist practice and kindness is also required. Ajahn shares his experiences of how peaceful his mind becomes in meditation when he adds kindness to his mindfulness. Buddhism and alien abductions? - What's Ajahn Brahm on about? Listen to the talk to find out. 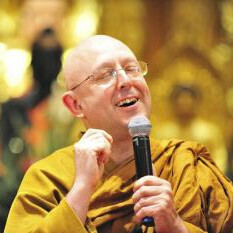 "Whatever that's here, it's important", says Ajahn Brahm. Ajahn teaches us a simple, yet powerful meditation technique to care for whatever that comes up in our mind. There is something much more than the spoken words. Ajahn Brahm teaches us the importance of being in a peaceful and kind environment. Ajahn Brahm talks about how to end arguing in relationships, politics, and etceteras. Ajahn Appi explains the basics of meditation and why it is beneficial to us all in so many different ways. Ajahn then led us through a 30 minute beginners meditation. After meditation, Ajahn talked on dealing with anxiety and stress, suggesting a number of different techniques using meditation to deal with it. Using the recent events in Burma regarding the plight of the Rohingya people, Ajahn Brahmali, talked about how to apply spiritual values when we are facing difficult situations. Ajahn Brahm talks about what happens just before, during and after the dying process, how to approach it and how to enjoy it. Ajahn Brahm gives an insightful talk on trust and its real importance. Ajahn talks about his trust in the moment and advises us to give trust freely to others and to accept when sometimes that trust is broken. Ajahn encourages us to trust ourselves and our abilities, especially in the spiritual path, because doing this gives us the confidence to give things a go and to develop and learn. Venerable Bhikkhuni Hasapanna discusses how to resolve conflict with mindfulness at Dhammaloka Buddhist Centre, Perth, Australia.